All staff members in an institution must have some understanding of why pests are dangerous to the collections and what to do if they find either live or dead pests around the building. Staff training is necessary to ensure ongoing success of an IPM program. Educating visitors is also helpful in helping reduce activity that fosters pest access. Below you can view PDF examples of some ways in which institutions provided training to staff and the public with PowerPoint slide shows, brochures, posters and other methods to ensure that everyone understands their role in successfully maintaining a pest-free environment. This educational and training IPM presentation by the Cornell University Libraries was created in 2007 by Joan M. Brink. It gives an overview of IPM practices with good information on preventing access at the building level. It also gives descriptions of insect and rodent pests that affect library and archive collections with pictures of damage to these types of materials. The in-house staff training presentation by the Conservation and Collections Management staff at the Smithsonian National Museum of the American Indian was created in 2003 by Rachael Perkins Arenstein and Veronica Quiquango. This presentation gives an overview of the goals and methods for implementing an IPM program including exterior and interior building modifications, monitoring, identification, reporting and treatment. London’s Natural History Museum created different PowerPoint presentations for in-house training of different groups of staff. This overview presentation includes information on identification, preventive strategies and procedures for general staff. For an examination of the Entomology department’s procedures, view this more targeted presentation. This single page document, also by NHM London, contains bullet points that outline all staff’s individual responsibilities as they relate to the institutional IPM plan. This document is an example of a document that can be distributed as a handout. They also created an educational poster for non-specialist staff. It provides concise information on what IPM is, as well as the institution’s “zone” system and their IPM signage. 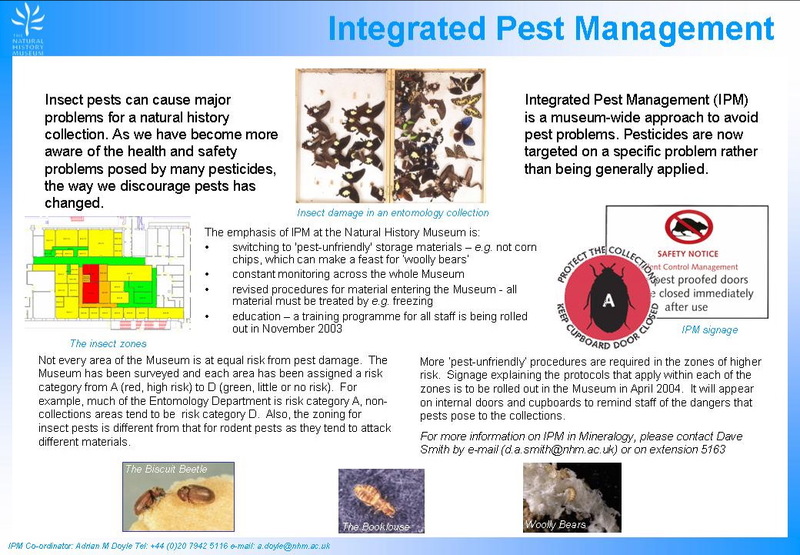 The Integrated Pest Management Group at the Natural History Museum, London has created this document to help Museum space planners, designers and architects understand how to create an unwelcoming and inhospitable environment for pests common in cultural heritage institutions. Pest Management at the CMN is a document by the Canadian Museum of Nature that serves as a basic introduction to general IPM practices and ideas. It outlines staff responsibilities as they relate to the institutional IPM program while providing information on several pests and the damage they may cause. Bilingual in English and French, the memo What can you do to prevent infestations? developed by the Canadian Museum of Nature outlines 5 points for staff to follow in efforts to keep spaces free from food that may serve as a pest attractant. Memo was originally distributed to staff along with pest proof containers for use in their cubicles. If You Notice Live Pests… by the U.S. Army Heritage and Education Center is a one-page document that was designed for museum staff and informs them of the six steps to take if they observe a live pest on an object. The School Program Guide, by the Smithsonian Institution’s National Museum of the American Indian, is distributed to school groups that have made a reservation to visit to the NMAI. It includes a section on page 3 which highlights the rules that are in place to ”make sure the entire collection is safe and remains undamaged.” This section, while informational, also acts to educate visitors about collection care techniques, including IPM. The Flies in Museums PDF fact sheet was created by Margot Brunn and Shannon Coles of the Royal Alberta Museum to facilitate the identification of common flies and to educate museum staff on the damage they can cause. These Pest ‘Flashcards’ created by the students of Sir Sandford Fleming College’sMuseum Management and Curatorship program are useful for in-house staff training, giving some descriptive appearance information along with a black and white line drawings and comically-presented facts on behavior. For more detailed information on pest identification and behavior please visit the Identification section of this site.